Balmoral has been the Royal Family’s holiday home since 1852, for seven generations and counting. 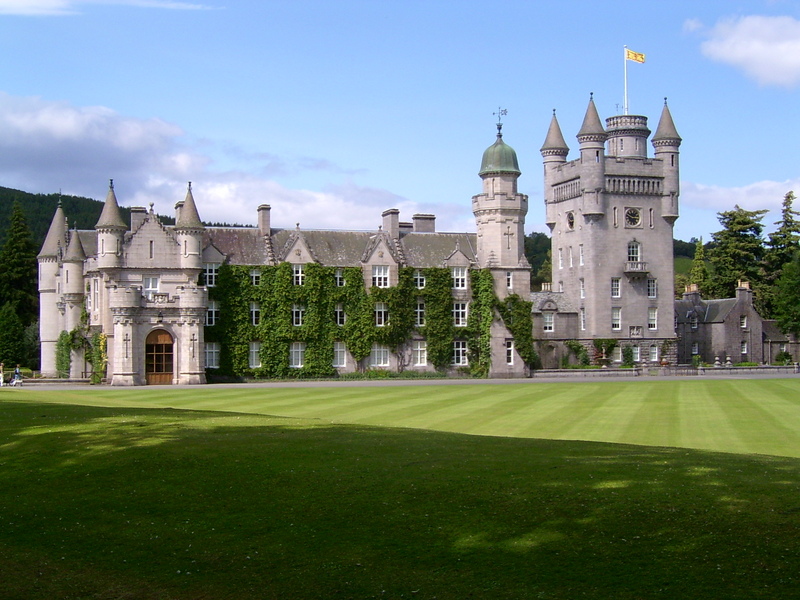 The present castle is the third Balmoral, and has become one of the more famous buildings in the world. The laying of the foundation stone for the present building in 1858 followed design ideas put forward by Queen Victoria’s husband Prince Albert to the Aberdeen architect William Smith. The white granite of which it is built came from quarries in nearby Glen Gelder. The castle is open to the public from April to July, attracting more than 80,000 visitors. It boasts magnificent gardens, country walks, gift shops, cafeteria, pony trekking, pony cart rides, exhibition of paintings, works of art and a tartan collection in the castle ballroom, an exhibition of Royal heraldry, commemorative china, photographic collection and display of wildlife, display of carriages and Upper Deeside Arts Society exhibition on view in the stables. The presence of the Royal Family is announced by the banner showing the Royal coat-of-arms that flies over the castle.